Craig Capurso: What's In Your Fridge? From Wall Street oil trader to IFBB Pro physique competitor, Craig Capurso knows the meaning of hard work. 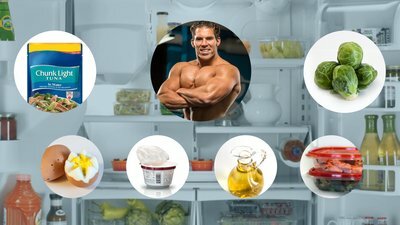 Check out what fuels his success with a peek inside the fridge of this Bodybuilding.com athlete. Craig Capurso is all about a well-rounded diet—and that includes a healthy work-life balance. The Cellucor athlete, entrepreneur, and family man fits proper nutrition into his busy schedule by planning ahead, without being ruled by the scale. While he used to measure everything out—and even called himself Mr. Tupperware—Craig's current work-from-home schedule allows for a bit more flexibility. 1. When it comes to foods with added sugar—like fruit juice and marmalade—what's your take on fitting them into your diet? You're probably referencing the fruit juice my wife has on occasion. I prefer to eat my calories and not drink them. Usually, the only calories I consume from liquid are egg whites, shakes, and supplemental drinks that carry trace macros. That said, I'm a flexible dieter and have adopted a "live full circle" mentality, which is all about moderation. There is certainly a time and a place to tighten things up, but on occasion a spoonful of fig marmalade makes its way into my oats. 2. You mentioned you now love Brussels sprouts. What advice do you have for people who don't love veggies but are looking to incorporate more green into their diet? It's all about smart prep. Try preparing vegetables with seasonings that don't hurt your calorie count but can provide the taste you enjoy. Spices like sea salt and garlic salt are great options. 3. Do you find that having tubs of chicken, turkey, and quinoa is easier than prepping Tupperware meals beforehand? I was Mr. Tupperware in a previous life. Heck, I wrote the "30 Days Out" trainer which talks about getting all of your meals prepped ahead of time. I work at home now, so it's just as easy for me to take a large container and allocate what I need for the next meal. I eyeball portions for the most part, but I still try to weight out my protein, which helps me strike a healthy mix between real life and fitness. 4. I love that you have an entire drawer of cheese. If you could only eat one type of cheese for the rest of your life, what would it be and why? I'm a big fan of pepper jack cheese. It's the perfect combination—a little bit of spice and zest with that unique cheese taste. I could add pepper jack to just about everything—except for ice cream and pancakes, of course. 5. Can you tell me more about the probiotics and flax seed oil in your fridge? I'm working to improve my gut health, so I added the probiotic to my morning supplement regiment to help achieve the levels that I want. When I'm looking to add more healthy fats and omega-3's, I reach for flax seed oil. 6. Your second freezer is filled with quick, heat-and-eat meals. What grab-and-go solutions can you suggest for people who might not have the room for a second freezer? When you're looking for something quick and easy, realize that you can get some decent, high-protein options on the go. A few of my favorites include Canadian bacon, yogurt, hard-boiled eggs, and tuna in a bag. Most larger gas stations carry these items, which means being busy is no longer a good excuse. 7. Most people have olive oil in their pantry, but what do you use primrose and borage oil for? I use both primrose and borage oil as sources of healthy fat. Both are high in gamma-linolenic acid (GLA), and provide support for healthy skin. I also find that borage oil helps me feel full longer.